AmazonSmile is a simple way for you to support ASNC when you shop with Amazon online, at no cost to you. Go to www.smile.amazon.com to select ASNC as your favorite charitable organization. You may also want to add a bookmark to www.smile.amazon.com to make it even easier to return and start your shopping there. ASNC will receive a donation when you purchase products that are marked “Eligible for AmazonSmile donation” on their detail pages. You can show your support everywhere you drive by purchasing an Autism Society of North Carolina license plate. A portion of the plate fee is donated to public awareness and autism education programs throughout the state. To learn how to order a plate from the NC Department of Motor Vehicles, go to www.ncdot.gov/dmv/vehicle/plates and click on the “Specialized and Personalized Plates” button on the right. Laurie Kennedy of Kennedy Kreations will donate a portion of all sales of her Puzzle Kollection to the Autism Society of North Carolina. The Puzzle Kollection is a line of classic, contemporary, everyday jewelry that promotes autism awareness. 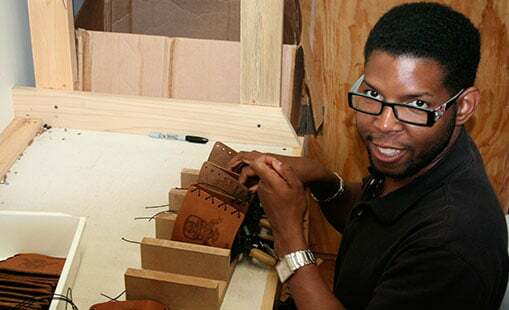 Oowee Products, an Asheville company that makes leather sleeves for pint glasses, will donate 15 percent of sales made with the coupon code “moreleathersleeves” to the Autism Society of North Carolina. Oowee’s sleeves are hand-stitched and assembled by individuals on the autism spectrum. Embrace The Difference® jewelry from REEDS promotes acceptance and raises funds for participating charities. If you select the Autism Society of North Carolina as your charity, $30 from your purchase will be donated to the organization. Help the Autism Society of North Carolina every time you shop online, automatically. Visit iGive.com or download the iGive app to begin shopping at more than 1,400 stores, and a percentage of your purchases will be donated back to us.